Whether your aim is to start your own business, accelerate your career or choose a new direction, you've come to the right place. From an undergraduate commerce program to an array of MBA offerings and specialized Masters programs and a world-class PhD program, as well as professional development opportunities, Rotman offers options for continuous learning throughout your career. The Full-Time MBA attracts top talent from around the world - ambitious professionals with the potential to become future leaders. The program combines 16 months of study with a 4-month opportunity for an internship. In their second-year, students may choose to specialize in a particular discipline to guide them toward a specific career path. The Morning MBA is for working professionals in the Toronto area who are seeking to unlock their leadership potential while maintaining their career momentum. Classes are held two mornings per week, from 7:00 to 8:59 a.m. The program begins in August of each year and takes 32 months to complete. The program length is 32 months. The Evening MBA allows you to enjoy the benefits of a world-class business education while allowing you to maintain your busy work schedule. Classes are held two evenings per week, from 6:30 to 9:30 pm. The program begins in August of each year and takes 32 months to complete. The curriculum is similar to that of the Morning and Full-Time MBA programs. The program length is 32 months. Looking to accelerate your management career? The Rotman One-Year Executive MBA is the perfect option for building your strategic decision-making and leadership skills. Innovative courses. Globally recognized faculty. And the stimulating environment of Canada’s leading business school, in the heart of downtown Toronto. Spanning five continents in 18 months, this unique MBA program will transform your career. Study in the world’s key business hubs, learning from respected faculty and interacting with high-profile corporate leaders and organizations. The Rotman Global Executive MBA immerses you in diverse working cultures, giving you the knowledge and skills you need to fulfill your potential in a world without boundaries. Add an international perspective to your healthcare management career in this 18-month program, which weaves together thought leadership, practical education and hands-on experience in three countries. Showcasing best practices across the global value chain, Rotman’s unique, healthcare-focused Global Executive MBA helps you build the skills and expertise to reshape your organization and explore opportunities worldwide. Develop the strengths that a rapidly changing economy demands in this intensive, eight-month full-time program. At the intersection of risk management and finance, the program provides you with you gain an ideal balance of technical expertise and leadership skills that will transform your career. 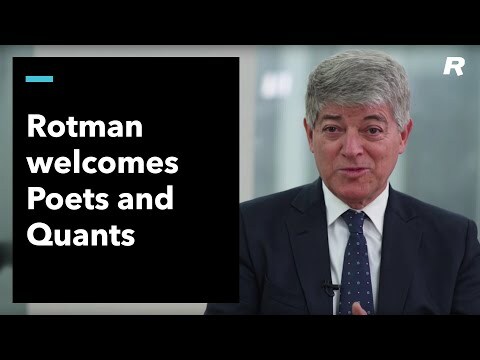 Accelerate your finance career by earning your MFin from Rotman. This innovative 20-month program features top-ranked faculty, cutting-edge curriculum and dynamic connections to Bay Street. From classic corporate finance to fin tech disruption, gain valuable knowledge and skills that will have an immediate impact on your current role – and transform your future. The world of data-driven decision-making is moving fast – and with a Master of Management Analytics from Rotman, you can help to lead and drive change. If you’re a recent graduate looking to be part of this exciting field, our innovative MMA program will give you the advanced data management and communications skills you need. Make your mark as an analytics professional in just nine months. The JD/MBA program is a four-year degree offered by the Rotman School and the Faculty of Law. This program combines graduate training in management with a degree from Canada’s most prestigious law school. Taken separately, these two degrees would take five years to complete. Note: GMAT waivers are available to applicants from U of T’s Faculty of Law. The Jeffrey Skoll BASc/MBA program brings together undergraduate studies in engineering and an MBA. It provides a fast track to a career as a manager or executive in a technology-based business. The combined MGA/MBA program provides students with an opportunity to integrate a truly international approach and perspective into their study of business and bring a business perspective to the study of global affairs. The Combined PharmD-MBA Program is a five-year combined degree offered by the Leslie Dan Faculty of Pharmacy and the Rotman School of Management. Join a close-knit community of scholars at one of the world’s top-ranked centres of management research – at the University of Toronto, in the heart of Canada’s vibrant, culturally diverse financial capital. As part of Rotman’s PhD program, you’ll explore new ideas, develop insights that inspire solutions and help to spark broader conversations among corporate and public leaders. Rotman Commerce, one of the nation’s oldest and most prestigious undergraduate business programs, is jointly offered by the Rotman School and the Faculty of Arts and Science. Commerce students receive a solid grounding in management fundamentals, while having the freedom to focus on a discipline that meets their academic and professional needs. The Rotman Graduate Diploma in Professional Accounting is an excellent way for you to gain advanced standing in the pursuit of a CPA. This 12-week summer program deepens your knowledge of accounting while satisfying four modules of the CPA Professional Education Program (CPA PEP). The program helps prepare you for the Common Final Examination (CFE) and allows you to advance straight to the Capstone 1 module in the CPA PEP. The Rotman School offers programs for individuals and custom programs for organizations to executives from Canada and around the world. Taught by respected and knowledgeable experts and driven by real-world challenges, Rotman Executive Programs aims to develop a community of leaders. The Initiative for Women in Business empowers women to advance in their careers and to pursue business education. Through its comprehensive portfolio of professional development programs, expert speaker series and networking events, and a network of more than 800 professional women, the Initiative helps women to refine their management skills and develop the tools they need to be effective leaders and senior executives. Rotman offers the Business Edge program for highly-skilled Internationally-educated professionals who are determined to leverage their full potential and take their careers to the next level here in Canada.